By Curtis L. Odom, Ed.D. 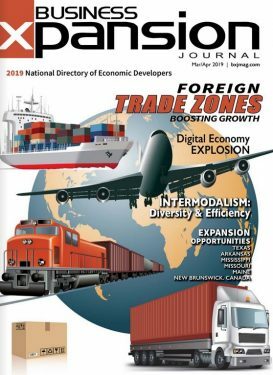 I recently read the November 2012 address by Cynthia Trudell of PepsiCo to the Graziadio School of Business and Management at Pepperdine University. The address resonated deeply with me for two reasons: First, because Pepperdine is my alma mater having graduated from the Graduate School of Education Psychology with my doctorate in 2009. Second, because the philosophy of the 5 Rs to talent management is one that I ascribe to in leading my Boston-based consultancy. The difference between our shared way of thinking is that I substitute the last “R” in PepsiCo’s perspective of “Right Way” with my paradigm of “Right Cost.” My reason being that everything in business comes down to cost. And cost is directly linked to key performance indicators, which can be used to measure current and future success. Trudell discusses that although HR at PepsiCo was doing many things well, and we were always there for their internal clients — they set their sights on helping their businesses achieve what she called the Five Rs: having the right people in the right place at the right time doing the right work the right way. The 5 Rs also have a strong connection to my new book, Generation X Approved: Top 20 Keys to Effective Leadership. I espouse 20 keys for leaders to use in unlocking the door to being effective in their important roles by mastering the No. 1 leadership competency on which all others are built — connecting with people. You do this by knowing their capabilities and addressing their concerns. It has always been the people. Without them what is a leader? What is an organization? And it is a fact that leaders in the 21st century are faced with many challenges previous generations never had to face: expanding global competition; a surge in loss of intellectual resources with the wave of coming boomer retirements; and a workforce with different generational values. To lead effectively you have to understand those you lead. Coach and Mentor to Cultural Fit, Not to Job Function — Developing and sustaining a positive and productive culture requires that people “fit.” It’s not just about talent or experience alone; you must make sure that the person you hire can align with the culture. Be Agile, Not Fragile — You have to be flexible and willing to learn in order to be an effective leader. If you are intolerant — brittle with those you lead and can’t see your way to make the right decisions because you’re unwilling to learn and adapt—then your leadership will fracture. And you can’t build a growing organization on a cracked foundation. Make Professional Development a Contact Sport — Education is good. Training is good. Real world experience is better. When developing yourself and/or your organization —look to the benefits that come from actual work in the field — getting your hands dirty — seeing what it’s like in the trenches. You’ll come away a stronger leader and will build a more effective and productive workforce with that understanding. What you, and your people, can actually do is much more important than any other aspect of business. Conduct Stay Interviews Often — Understand why people want to stay with your company rather than fixate on why some choose to go. This ties back to the impact the leader and/or organization make at the granular employee level. Odds are if it’s unfavorable … then at some point that person is going to leave and not many (if any) of their answers will be of importance. Leaders and organizations are better served if they try to find out what makes people enjoy working for them or for the company. It’s a reinforcement of the positives that eliminates the need for retroactive fixes of someone’s perceived negatives regarding a leader or company and in the long run proves to be far more important. Accept Change as Frequent Visitor — Along with the fact that there are always problems and issues to deal with, is that change is constant. In dealing with change you can make mistakes and these are often caused by internal politics, generational differences and miscommunication. That last item also holds the key to minimizing and mitigating missteps — leaders must communicate clearly when it comes to expectations and execution of policies within the organization. Become the type of leader that places more importance on the individual performance and less on their title. Most importantly — treat yourself the same way. Don’t get puffed up because of your title or position; instead show everyone that you earned respect by who you are and what you do as opposed to what’s on your business card. Make these action items the center of your preparation and mastery as a leader. Seek to influence and inspire, not to drive and direct. If you do you will connect with your people in a way to unlock your own door to being a more effective leader. For more information, visit www.doctorcurtisodom.com. 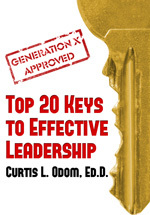 Learn more about Generation X Approved: Top 20 Keys to Effective Leadership.